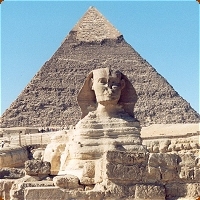 Built during the Golden Age of Ancient Egypt, the pyramids at Giza are the only surviors of the Seven Ancient Wonders of the World. It is believed to have been built as a tomb for Fourth dynasty Egyptian pharaoh Khufu (Cheops) and constructed over a 20 year period concluding around 2560 BC. The Great Pyramid of Giza is the main part of a complex setting of buildings that included two mortuary temples in honor of Khufu (one close to the pyramid and one near the Nile), three smaller pyramids for Khufu's wives, an even smaller "satellite" pyramids, a raised causeway connecting the two temples, and small mastaba tombs surrounding the pyramid for nobles. In the 14th century (1301 AD), a massive earthquake loosened many of the outer casing stones, which were then carted away by Bahri Sultan An-Nasir Nasir-ad-Din al-Hasan in 1356 in order to build mosques and fortresses in nearby Cairo; the stones can still be seen as parts of these structures to this day.